I bet many nature enthusiasts have experienced the frustrating feeling of hiking or camping during the night when all of a sudden their flashlight batteries have died. If you forgot to bring spare ones, good luck figuring your way out in the darkness. 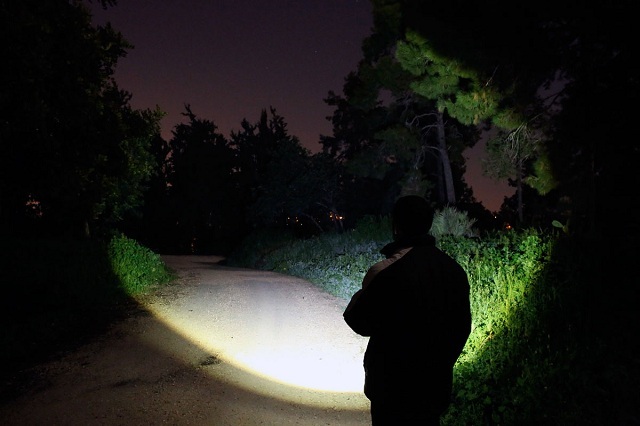 You have two options left in this case – stay wherever you are and wait until the sun rises, or head back home using the flashlight of your mobile phone (if you have one, that is). You see of how huge importance is having a flashlight to guide your way? Well, you’ve learned your lesson the hard way, so play it smarter next time you decide to go out and explore out in the dark. But what’s the most reasonable solution to this problem? Rechargeable flashlights! In the evolution of the flashlight rechargeable is the latest and most advanced development. You basically don’t have to use disposable batteries and pray to God they don’t run out just when you forgot to take spare ones. They are one fine convenience which can be a life saver. Now let’s take a look at what is it that makes these devices so sought after. If you want an extremely powerful flashlight (and I’m sure you do because the brighter – the better), you will spend a lot of battery packs if you go with the non-rechargeable option. A pair of AAA batteries costs at least 5$, so purchasing one bi-weekly will rob you of more than 100$ per year. On the other hand, the average price of rechargeable flashlights is around 150$, which might be more expensive but it is the more cost-effective solution in the long run. Plus, if you take good care of it, a flashlight rechargeable battery can last you for more than 5 years. Bottom line is, investing in rechargeable torch certainly pays off more. If you are a heavy user, eventually your flashlight is going to run out of juice. And that’s where the charger comes in. Many rechargeable flashlights come with a USB port, which means they can be charged by plugging them into your laptop, RV power outlet and even phone. Incredibly enough, there are even new high-end models that can be charged on solar energy. Perfect for when you’re in a remote spot without any power options available. A flashlight that’s always ready for use is an essential part of any outdoor experience. Especially in Australia, where the terrains are rough and there are many deadly snakes and spiders sleeping under rocks. You can’t risk your health and be ignorant of what’s going on around you. Plus, the fear that you’d be left out in the dark with no batteries is a stress on its own and it is definitely a party breaker. Put yourself at ease by knowing that you have a reliable flashlight that won’t let you down in times of darkness.